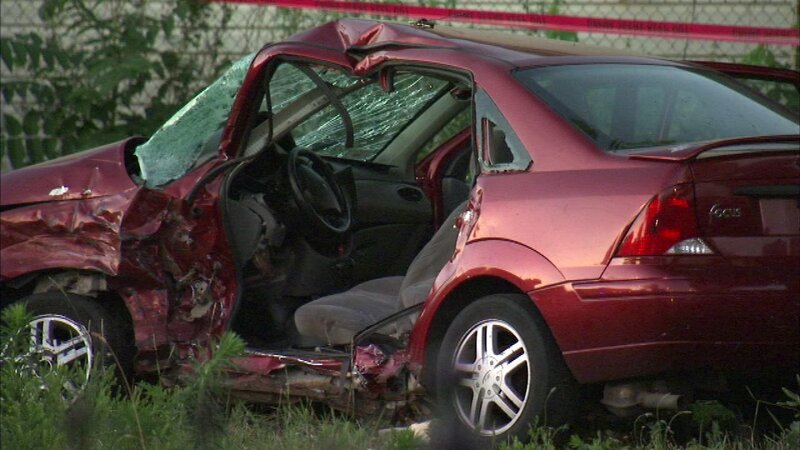 CHICAGO (WLS) -- A 47-year-old woman was killed Saturday morning after a vehicle fleeing Chicago police crashed into another vehicle in the Englewood neighborhood, Chicago police said. Shortly after 1 a.m., police saw someone inside shooting from inside a vehicle in the 5800-block of South LaSalle Street, police said. Police pursued the white Kia SUV and arrested the woman driving, but during the arrest, a man inside the SUV jumped behind the wheel and tried to drive away. As he tried to flee, he crashed into a maroon Ford Focus. Two women were inside the Ford Focus. The 47-year-old driver was pronounced dead at the scene, police said. She died of multiple blunt force trauma. A 21-year-old passenger was transported to Stroger Hospital. Chicago police had initially erroneously reported that both Ford Focus occupants had died. The 21-year old female passenger of the SUV was released without charging. A handgun was recovered from the glove box of the SUV. Richard Johnson, 29, was charged with one misdemeanor count of possession of ammunition without a valid FOID after he was found to be in possession of ammunition that was recovered from inside the Kia SUV, police said.